2015 is the 40th anniversary of the Honda Gold Wing; a comfortable touring motorcycle that's become one of the best-known brands in biking. Stock 'Wings tend to be ridden by mustaches-and-hawaiian-shirts. But when it comes to customization, few bikes are built in so many distinctly different ways. What's your style? I'm a fan of the stripped-and-simplified retro-style variants like Quentin Hunt's "Bold Wing." Sometimes when I'm stuck on a flight between two crying babies and a neurotic chihuahua I imagine dismantling a Gold Wing's fairing and just the fantasy of relieving the machine of its burden is satisfying enough to calm me down. But I hear some folks like to put extra wheels on the back and add a person's weight-worth of neon sticks. You keep doing you, moto-ravers. Just don't pop any pills before you park the bike. The 1832cc 2015 Gold Wing will hit dealerships this October, with the slightly more aggressively-tuned Gold Wing F6B model coming in out a month later. 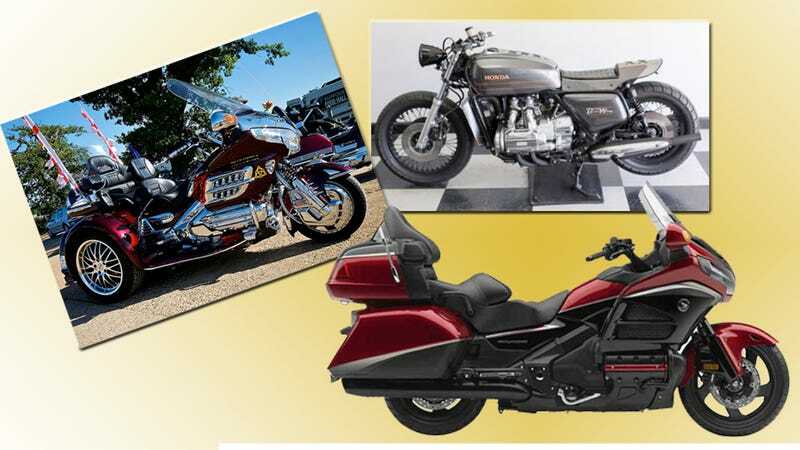 The Gold Wing has packed on a lot of pounds since its first run (above), now standing at just over 900 pounds in its slimmest trim. The 2014 model does 0-60 in about four seconds and gets mid-30's MPG for fuel economy.